Carey Q. asks: How do they calculate what proof alcohol is and why is it called proof? An early example of beneficial government regulation, to proof alcohol was simply to test and verify that the contents of a barrel of liquid was what it was claimed to be. The process began in England around the 16th century. Its original purpose was not consumer protection, but rather to ensure that the state (read: the King) collected the proper amount of taxes on the sale of the product (alcohol, called proof spirits, was taxed at a higher rate). The first method was imprecise at best, and involved soaking a gun pellet in the liquid, and then trying to light it on fire; if it burned, it was classified as a proof spirit. However, as alcohol’s flammability is dependent on its temperature (the higher the temperature, the more vapors the alcohol infused solution will emit, and, therefore, the more flammable), sometimes actual alcohol was passed off as something less (and taxed at the lower rate). Nonetheless, frequently the product would catch fire, and by that the authorities would know that the spirit (usually rum) was at least 57.15% alcohol by volume (ABV), which at that time was classified as being 100 proof. As scientific skills improved, by the early 19th century, a far more accurate test was developed which measured the liquid’s specific gravity (the ratio of the density of a substance to a reference, in this case distilled water). Distilled water is actually denser than alcohol. Accordingly, in 1816 a test was developed that relied on the fact that at 11°C (51°F), a 100 degree proof spirit (~57.15% ABV) would weigh 12/13 that of distilled water. As 57.15% is roughly equivalent to 4/7, in the UK to convert a lower alcohol to proof, you simply multiply the ABV by 7/4 (or 1.75); so, if you had a delicious IPA with an ABV of 6.9%, in the UK this would be 12.075 degrees of proof, while a 100% ABV pure alcohol would have a proof of 175 degrees. In the US, this somewhat complicated method was rejected (in an early example of tl;dr), and instead proof is simply calculated by doubling the ABV. So, in the States, that IPA would be 13.8 proof, while Jack Daniels, with an ABV of 40%, is 80 proof. Of course, some spirits far exceed these ABVs, with a number of neutral grain and rectified spirits reaching ABVs of 96% (168 degrees of proof in the UK and 192 proof in the US). 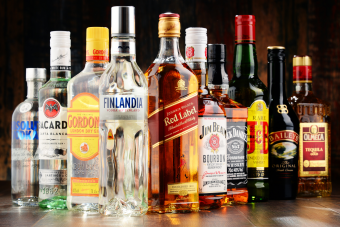 In the United States, these alcohols are regulated, if at all, by the particular states; for example, Nevada prohibits the sale of alcohol in excess of 80% ABV, and California prohibits the sale of anything over 60% ABV. Uncle Sam has singled out one alcohol in particular for regulation, however, – absinthe. Sometimes called the Green Fairy, this exotic, strong spirit (ABV 45-75%) infused with green anise, fennel, other herbs and most notably, grand wormwood, fueled Paris’ Belle Époque and is credited by some as inspiring a variety of artistic movements (e.g. Surrealism, Impressionism, Post-Impressionism, Modernism and Cubism), as well as the writings of notables including Oscar Wilde, Charles Baudelaire and Ernest Hemingway. In the early 1900s, a number of countries banned absinthe (1912 in the US), due in equal measure to a smear campaign conducted by the wine industry, lurid tales of men under its spell committing horrid violent crimes, and the presumed presence of thujone, a chemical compound that is said to be poisonous in large amounts. As it turns out, however, most absinthe has very little thujone and easily meets all regulatory requirements (in the US, no more than 10ppm). Accordingly, beginning in about 2007, absinthe returned to the US, both as imports from Europe along with domestic producers springing up, as well. Which liquid, water or alcohol, has stronger intermolecular forces? Why does alcohol have a lower specific gravity than water? Why Is Alcohol Measured By Proof?